The foremost home of democratic government in the world has taught another lesson about open and close in government. The government was shut down twice in the last two weeks over disagreement on the country’s budget and was opened again on both occasions after agreement on the way forward. It was a period to trade policies against policies and a period of give and take, when rigidity in politics was eschewed, at the expense of ordinary people's interests. The Federal Government and a section of the media opposed to the former's policies continue their war path, while another section of the media supportive of the government’s policies drums home its support. It is the second year of the Donald trump’s presidency, with the economy intact and making the government operatives feeling happy, despite the opposition’s drumming of an end that has refused to come. Deferred Action for Child Arrivals, DACA is still in the news tumbling amid news about talks of immigration policy reform, and reports that Trump touting of readiness to help affected immigrants, if the Democrats are ready to support the building of a wall to stem illegal migration. The Republicans are supportive of building a wall across the Mexican border with the U.S, while the Democrats are against the wall. Will the Democrats support building the wall, if Trump gives to the DACA migrants remaining in the U.S? Will the Democrats swallow their pride over the wall to help the DACA migrants? But what is wrong about building the wall anyway other than that Trump has the boldness to form the wall policy despite years government running away from the issue, and that the Democrats have chosen to play politics with the issue as if it is form humanitarian disaster? Researching on a subject reading through Robert Lloyd and Glen Guzzo's Writing and Reporting the News as a Story, a book that I used during the Journalism's Master program in 2012/14, discussed the topic about whether building the wall could create any political setback. 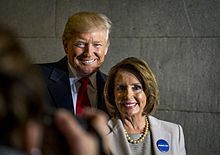 It is the political setback that the wall idea is capable of creating that has made politicians to avoid the wall idea like a leper over the years, and that Trump is the only one who has dared going ahead with the idea, and one of the reasons for his unpopularity with the left wing politicians and their supporters. Meanwhile, there is an uncomfortable silence about the Special Counsel Robert Mueller’s investigation into alleged Russian interference in the country’s election. The last widely reported issue from the investigation was the likely interview of Trump by Mueller. After that announcement, there has been silence. The silence has been broken by resignations by two White House senior officials over abuse of spouses, bringing the fall from sexual abuses that have rented corporate bodies across the country into the government house. Trump said in a news report about mere allegations wrecking lives, one week after the New York Daily news published the president’s naked photograph on its front page. Many people are still at a loss as the reason for the publication Trump's naked photograph by the Daily News, other than a newspaper on a wrecking mission, since the publication does not seem to have impacted any moral lesson or in alignment with any desirable news report. Many people had first thought about the publication of the naked photo of the president was the possibility that the president may have been caught in a sexual act in the White house like some corporate gurus that have fallen from sexual misconduct related issues, on seeing the publication. Of course, Americans cannot forget Carlos the Danger in a hurry. But above all the politics in Washington, it is the tax season when Americans file their taxes and expect to pay back or secure some returns. However, there is no way Americans will know the gains accrue to them from the recent tax law changes, because the effect of the changes may not kick in until the next tax season.